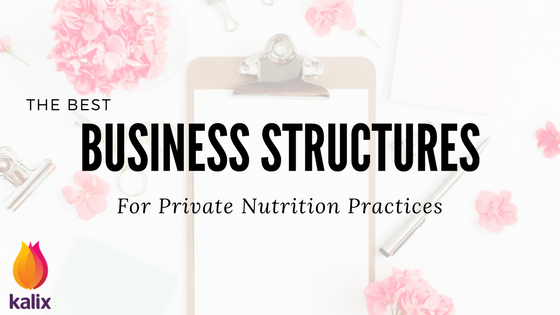 The Best Business Structures For Private Nutrition Practices – The Official Kalix Blog. If you are starting your own private practice, there are many factors to consider; practice location, website setup, marketing strategies, referral pathways…A crucial piece of the puzzle (and the topic of this blog post) is business structure. When examining business structures, you need to decide on what type will best fit your needs now, but also your requirements in the future as your practice grows. Each option has its own plus and minuses. Your decision will impact on how much tax you pay, the amount of required business paperwork and your personal liability. Let’s look at each business structure, and their legal and tax requirements. This is the easiest and cheapest type of business to set up. Sole proprietorships as the name suggests are owned by a single individual. This business structure is only an option for you if you’re ‘going it alone.’ As a sole trader, you don’t need to register your business with your state, and as the owner, you get all of the business profits. The biggest downside is that you’re personally liable for your business financially and legally. If your practice is sued, your house, savings, and other personal assets are at risk (professional indemnity & liability insurance can assist with this). From a tax perspective, you report all business profits as personal income. Self-employment tax (calculated based on the net income of your practice) must also be paid. Partnerships are very similar to sole proprietorships, except they are run by two or more persons. If starting a practice with others, this business structure is worth considering. When forming a partnership, a little bit of set-up is required. Your business may need to be registered with your state. You should also get a partnership agreement in place. The partnership business model stipulates all partners share the profits and control business operations. An agreement can assist in settling potential business conflicts and clearly define the responsibilities of all partners. Like sole proprietorships, all owners have financial and legal liability for the business. If someone in your practice is sued* or something else goes wrong, all partners’ house, savings, and other personal assets are at risk (professional indemnity & liability insurance can assist with this). As a partnership, your business itself doesn’t pay any tax. For informational purposes, you’ll still need to file a special form to the IRS, an annual Form 1065 (Return of Partnership Income). Each partner should also submit a Schedule K-1 to report their share of profits. Tax is paid based on what you and your business partners pay in personal income tax (and self-employment tax) from on your share of the profits. *The forming of a limited liability partnership (LLP) can “shield” you from liability for the acts of other partners or employees. An LLP is similar to a limited liability company (see below for details), but the LLP operates under partnership rules. Because LLP is a type of partnership, I do not discuss this structure as part of this blog. Limited liability companies structure provides liability protection for business owners. An LLC is formed by filing Articles of Organization. An LLC has its own assets and liabilities, separate from its owner/s. The business itself does not pay corporate taxes. Instead, you are taxed (as with a sole proprietorship or partnership) through your personal income from your share of the profits. You are still responsible for paying self-employment tax. If your LLC has other owners, it must file a Form 1065 (Return of Partnership Income) to the IRS for information purposes, along with a Schedule K-1. The business may need its own employer identification number (EIN). Some states do not allow professionals whose occupation requires a license, e.g., dietitians, to form LLCs. If this is the case, you can create a PLLC (professional limited liability company) instead. PLLCs are considered a type of LCC. Hence, I will not go into detail about their structure. PLLCs are formed by filing articles of organization and require that your registered dietitian status (along with all owners) to be verified before the PLLC filing is approved. All owners may be required to be licensed in the same profession. Corporations are businesses set up as their own legal entity. They are owned by shareholders and require a board of directors. There are two different types of corporations C-Corporations and S-Corporations. S corporations are similar to LLC, they have the liability protection but pay no corporate tax. As an owner, (called a shareholder) you are taxed through your own personal income from your share of the profits as well as through your wage. As an owner-worker, you considered an employee for tax purposes and will be required to pay yourself “reasonable” compensation, i.e., a salary before receiving profits. S-corps do not pay self-employment tax, but regular employment taxes apply to wages. You can form an S-corp by filing a Form 2553 with the IRS and articles of incorporation with the state you operate in. An informational corporate tax return must be filed each year using the Form 1120S (with a Schedule K-1 if there are multiple shareholders). A C corporation pays its own taxes separately from its owners. As an owner of a C-corp, you also pay taxes on your dividends from shares and employee wages. Setting up a C corporation is the most complicated and expensive of all the business structures. You are required to register your business name, file a certificate of incorporation, draft corporate bylaws and hold a board of director’s meeting. At tax time C-corps must file Form 1120 or Form 1120-A with the IRS. As a c-corp you may be double taxed. Business profits are taxed (corporate tax) and then taxed again when distributed to shareholders as dividends. If this article has helped you in any way, please let us know in the comment section. We much appreciate your feedback. Disclaimer: the content here is intended only to provide a summary and general overview on matters of interest. It is neither intended to be comprehensive nor to constitute legal or financial advice.